Toronto’s beloved go-to Tex-Mex restaurant and concert venue, Sneaky Dee’s is ecstatic to launch a new and improved website! The site continues to boast menu and special favourites, concert listings, and special events, with new additions including “Our Story”, the official Sneaky Dee’s blog, and merchandise! The new, easy to navigate site serves as the online hub for the well-known restaurant and concert venue, while featuring a fresh, organic design. Along with the re-birth of the website, the one and only Sneaky Dee’s is preparing to expand their already delicious menu by unleashing a signature line of hot sauces. Not only will they offer an assortment of flavours to complement every Tex-mex meal, but the hot sauce is now available for purchase to slather on your nachos at home, for the very reasonable price of 5$ a bottle. 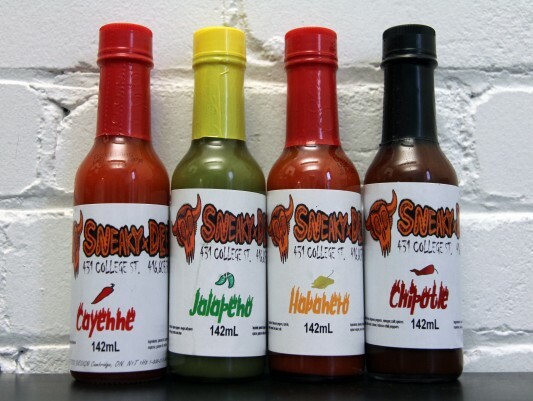 Available on location (431 College St. Toronto) Sneaky Dee’s will sell 4 flavours of sauces differing in levels of taste and heat, including: Jalapeno, Cayenne, Chipotle and Habanero. While the food needs no assistance in flavour, Sneaky Dee’s invites you to add a little more guts to your favourite dishes! The iconic Toronto venue and restaurant has maintained a large social and cultural presence within it’s city’s borders. Sneaky Dee’s has long been an attraction for avid music lovers and nacho enthusiasts, even before it moved to its current location at College and Bathurst. Constantly adapting to the changing times, Sneaky Dee’shas become a home away from home for a distinct Toronto community. This November Sneaky Dee’s will include new menu items and weekly events that will be sure to catch your eye. The new website will offer detailed information and photos of the food and events that they have cooked up. Sneaky Dee’s started as a family business in 1987 and not much has really changed. Sure, the raging city of Toronto has claimed Sneaky Dee’s as its own — everyone from Arcade Fire to Fucked Up has graced the darkly lit upstairs stage, and it has made a mark as a cultural institution. Through the hard times and the good, Sneaky Dee’s (known to locals as “Dee’s”, “Sneak’s”, or “Sneaky’s”) has opened their arms and wrapped them tight around our bustling metropolitan. This big bear hug has touched Toronto civilians and tourists alike and it’s born a vibrant community. A home away from home, Sneaky Dee’s is a good family to have. They feed you when you’re hungry and send you home only when you’re stuffed to the brim! The kitchen is always open late and the night is always young. Sneaky Dee’s is a bomb of energy and dazzling with nostalgia. A place to sit and to dance, and home to the most reasonably priced menu in the city’s grid. Always a hip tune on rotation in the dining room, Sneaky Dee’s is a remedy of laughter and good people. Famous for its Tex-Mex and pub-style favourites, if the familiar faces don’t keep you coming back, the King’s Crown nachos certainly will! Originally located on Bloor Street and a stone’s throw away from Honest Ed’s, Sneaky Dee’s had a true, authentic, punk rock inception in the 80s. Still an integral part of the music scene, today Sneaky Dee’s concert venue is home to a number of the city’s best parties. From What’s Poppin’ on Wednesday nights to Shake A Tail on Saturdays, upstairs at Sneak’s is always raving with the underground and independent culture of Toronto. The 200+ capacity concert venue has seen some great talent grace its stage. From Broken Social Scene to Feist, Sneaky Dee’s has hosted local and touring musicians since it began (sort of serendipitously) in the basement of the restaurant’s first location. From punk to hip-hop and every indie darling in between, catching a band at Sneaky Dee’s is always a memorable night out! Whether you’re surrounded by rabble-rousing scenesters out celebrating a independent vinyl release or your favourite west coast buzz band makes a stop in town, it’s likely happening on the Sneaky Dee’s stage. Tourists and artists often fill the downstairs booths, but if music and great food aren’t your thing in Toronto – having a seat at the bar, taking in the atmosphere over a pint, and watching the Jays or the Leafs is also an option. Now one of Toronto’s busiest independent restaurants, Sneaky Dee’s will continue to prove itself as a staple and go-to hub of culture in Toronto. So really much has changed, but at the heart of it all is a community who likes their nachos slathered in cheese, their bar booths etched with inside jokes, and their friends just a King’s Crown away. Welcome home. For all media and marketing inquiries: sari@audioblood.com. Photo by Daniel Bray danielbrayphoto.com.